Sometimes, people will say, "Oh I am not going to look at the Photo section of Ancestry, because who would have any pictures of my relatives? I'm sure I am the only one doing this research in my family". Here are valuable pictures that I found for people. 2) A picture of a letter showing permission given by a young woman's father to get married even though she was under age. 3) A picture of a woman's headstone showing the actual birth and death date that someone never had before. 4) A picture of an adopted girl's real mother. Just to name a few, don't be disillusioned in your research. Make sure you set aside a Document or Location page to watch the migration of your family. Thank you for leaving a kind message or inquiry. 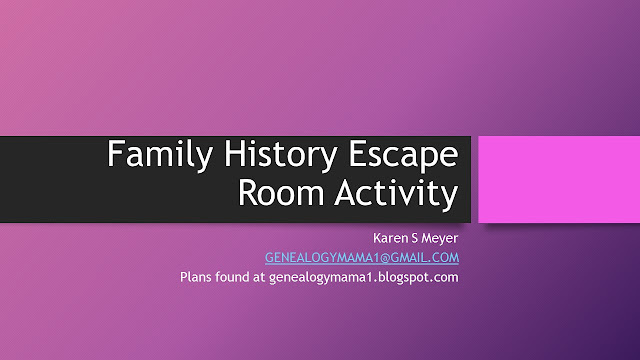 Family History Escape Room Game Plans - Everything you need! The Ghost of George Alley is leaving messages... Sally's Parents do not know who the Ghost is. They only know that his cryptic messages he has left in the attic may be the key to either some serious treasure, or may even lead them to documentation which could land Sally a College Scholarship, being the Great, Great, Great Granddaughter of a Civil War Hero. Complete game plan - laid out in Powerpoint, Word and all the clues - ready to put on this week if you want. You just supply the various locks and props that are in the script. Loads of fun and without realizing it, the YSA or YW/YM get some lessons in how to research using keywords and valuable life learning tools! * * * * * * * * * * * * * * * * * * * * * * * * Where did I get my props? Discover your loved ones, Gather them together and Connect them for Eternity. We have so much to share and the conference is only 1/2 over! Take a look at our interview with Thefhguide.com - what an awesome group of people! 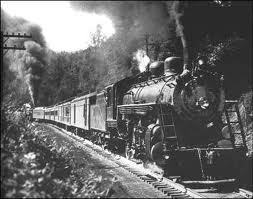 What did your Great-Great-Great Grandfather do for a living? When researching your family ties, you run across Census sheets. These tell you where the person lived, with whom, how long they were married, the present status of marriage, the children's names and as their occupation, it lists student or whatever job they held. My Grandfather used to deliver for a Drug Store. That's pretty easy to understand because in America, we know what occupations we have. Now, what if your ancestor is from "across the pond" in jolly ole' London? Do you know what his occupation on another census from another century might be? Now with this link, these people have gone throuh the amazing effort to categorize every occupation and its' definition for you to ponder. What can you do with it? Nothing. Merely marvel at what they did and how they endured it. Thank you to A Walk Through the Lens for putting this together.